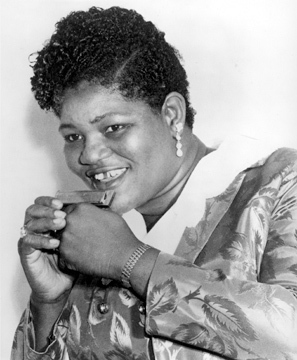 Willie Mae "Big Mama" Thornton was an American rhythm and blues singer and songwriter. She was the first to record the hit song "Hound Dog" in 1952. The record was #1 on the Billboard R&B charts for seven weeks in 1953; the single sold almost two million copies. Thornton wrote and recorded "Ball 'n' Chain", which became a hit for her, yet Janis Joplin's later recording of it made a bigger impact in the late 1960s. In 1954, Thornton was one of the eyewitnesses to the accidental self-inflicted handgun death of blues singer Johnny Ace.